aximizing revenue in your facial aesthetic clinic practice requires innovative thinking. One of the most efficient ways to increase clinical profits is to convert single users (clients who come to your clinic for one specific treatment) into dual or even multi-users. Many patients enter the clinical space with a fixed idea of one procedure they believe they need, but could often benefit from a combination of treatments over a period of time. Converting single users into dual users guarantees both improved patient outcomes and more lucrative earnings. Aesthetic clinics have high overheads, so it is vital to maximize the profit you make in your office space to ensure value for money. Encouraging patients to become dual users who reap the benefits from more than one procedure per visit is one of the most effective ways to achieve both objectives simultaneously. However, this naturally begs the question: how do you transform a single user into a dual user? Facial aesthetic treatments are a luxury, and convincing patients to part with their disposable income requires intelligent use of tools and techniques to highlight the range of treatments your clinic has to offer. Interestingly, consumer psychologists note that even in times of financial hardship, individuals are likely to cut back on larger aesthetic investments (such as surgery) but increase their purchases of smaller indulgences, such as Botox or dermal fillers. Such minimally invasive procedures are growing in popularity as a financially-friendly investment in beauty and well being. 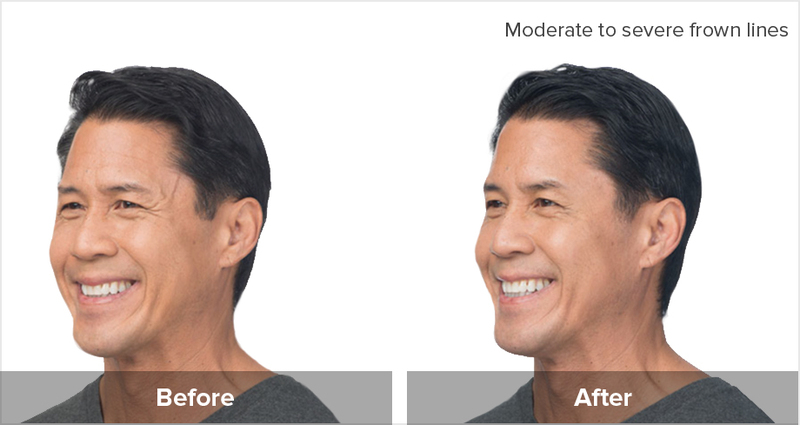 One of the most powerful tools to convey the efficacy of minimally invasive procedures and convince patients to invest in multiple treatments, are facial aesthetic photos. 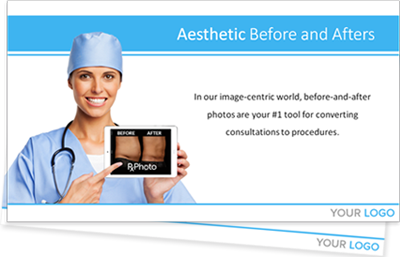 Before and after photographs (B&A photos) are not only a critical element of the cosmetic surgery medical record, but also an integral component of aesthetic clinic marketing campaigns. Photographs present a visual narrative of your patient’s facial anatomy, often capturing angles or sides of the face that are not accessible when looking in the mirror in the morning. Incorporating photographs of your patients into their consultation holds myriad benefits. Patient empowerment and increased awareness can be as simple as handing the tablet or device over to the patient and asking them to identify and comment on what they do not like or feel uncomfortable about with respect to their facial appearance. If you have a range of high-quality photographs that capture different angles and close-ups of the eye area, lips, and jawline that your patients are able to engage with, as a consequence, they will develop a more balanced awareness of how aging impacts on diverse aspects of the face, and the way in which different products can address these effects. You can then offer recommendations regarding a combination of treatments for optimal results. Once the client has identified the elements of their face that they would most like to see improved, you can then respond by identifying the treatments that would most effectively address their issues. 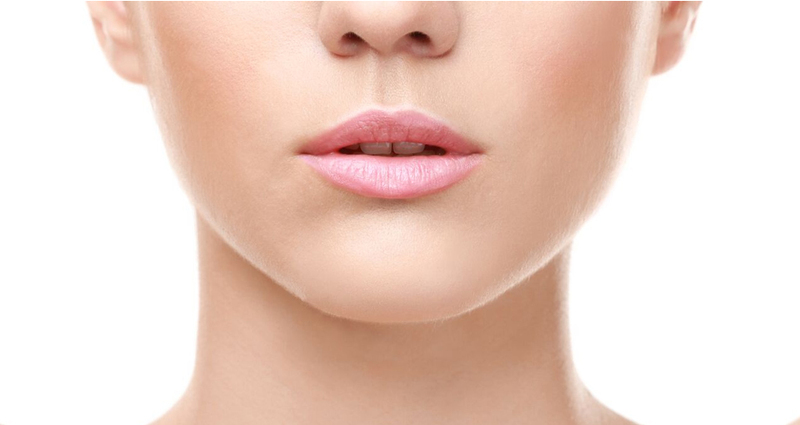 While the majority of today’s aesthetic patients are savvy, informed and have generally executed some research prior to setting foot in your clinic, many still have limited or fixed ideas about the areas of the face that require attention. To illustrate with an example, there is generally a high level of awareness around Botox and other neurotoxins used to treat wrinkles, but less understanding regarding the way in which volume loss emphasizes facial aging--particularly when fat descends from beneath the eye into the malar (cheek) area, rendering the eyes hollow and tired, and giving the cheeks a saggy appearance. Well-shot 45 degree angle photographs mean you can effectively convey to your client that combining treatments optimizes results. You could highlight the way in which fat loss beneath the far eye (tear troughs) could benefit from dermal fillers, such as Restylane, but also that Botox can erase creases at the edge of the eyes, resulting in a more refreshed appearance. Dropping pins on the areas to be treated in a frontal photo and annotating the recommended number of units to address the issue can also help your client to understand the financial investment involved. Using facial aesthetic photos in an educational manner not only increases the likelihood that patients will become dual users, but also underlines your professional knowledge and competence: with ever increasing new products, technologies and devices improving facial aesthetic outcomes, raising client awareness around their existence helps them to feel safe and confident in your practice, and engenders improved relationships. 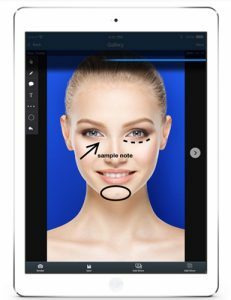 Medical Photography Apps such as RxPhoto offer special features that can further enhance clients’ understanding of different products and the effect they render on the face. Sliding photos are highly effective in visually communicating the improvement made by fillers such as Juvederm in the lip area, Kybella in reducing fatty deposits beneath the chin, or Dysport in smoothing out creases in the forehead. The digital drawing tool can be used in lateral view photographs to emphasize the benefits of multiple treatments to correct issues that are not always evident. Smile lines are always more pronounced in lateral photographs. Sun damage is also more apparent: for example, most Americans have more sun damage on their left side of their face from driving. Although patients are understandably more concerned about their frontal appearance because that is what they see when they look in the mirror, day-to-day interactions mean lateral appearance is also frequently visible to those with whom we interact. Use the digital drawing tool to highlight areas that could benefit from treatment around the lateral aspects of the face. Photo galleries can powerfully illustrate the benefit of combining two or more procedures, and their effects over time so your patient can witness the way in which their facial landscape responds to the treatments, and how other treatments in future may further complement results. Website galleries are indispensable in encouraging potential patients to first set foot in your clinic in search of a specific facial treatment, while in-office galleries fulfil the next step of educating patients about the advantages of receiving more than one treatment. 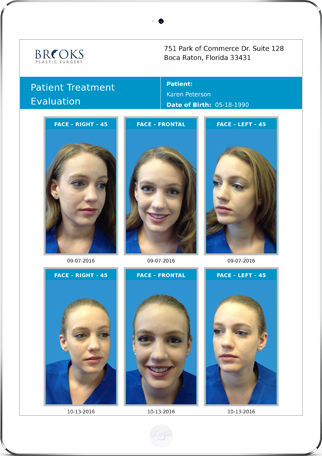 You can also refer to the photo galleries of other patients with similar facial features to help foster an understanding of the kind of results that can be expected. The morphing tool clearly manifests improvements that the treatment has made. 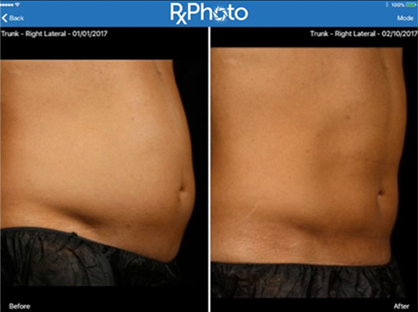 If patients can’t see a clear difference between their before and after photos, or they can’t remember what they looked like two months ago, the morphing tool helps to manage their expectations by morphing the before picture into the after picture, highlighting the difference. Practice-branded reports complete with patient photos are an invaluable record of the changes and improvements that have resulted from treatments. They also function as an educational tool that may include post-procedure guidelines for care. Many patients proudly share their reports with friends and loved ones, thus meaning reports also operate as an informal form of marketing. 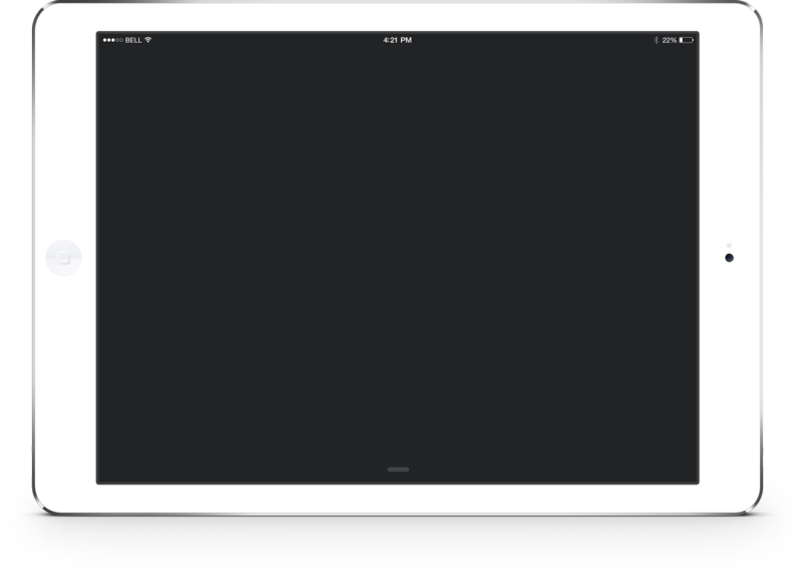 Patient photography app, RxPhoto, has a feature which allows you to print out reports and patient photos with the practice logo and address at the top. 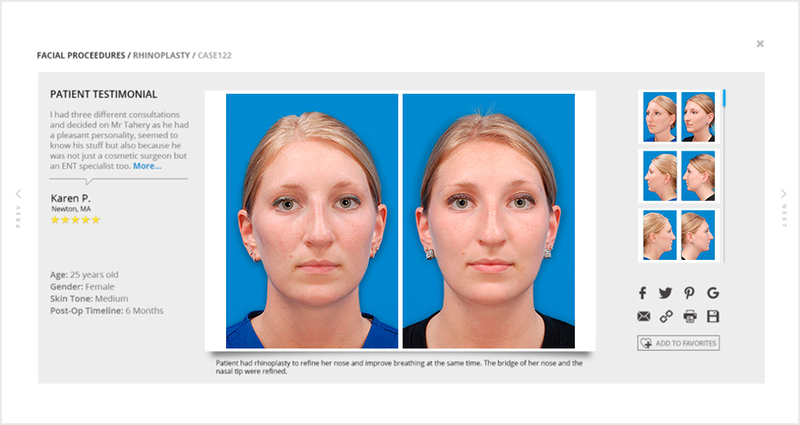 Ultimately, facial aesthetic photos offer an invaluable tool in helping you convert patients into dual or multi-users. Ensure the photos you take are of the highest quality possible, and use them as a platform to talk about the excellent products your office provides that single user patients may benefit from considering.